Oldman, McDormand best actors, Shape of Water best movie at Oscar – Royal Times of Nigeria. 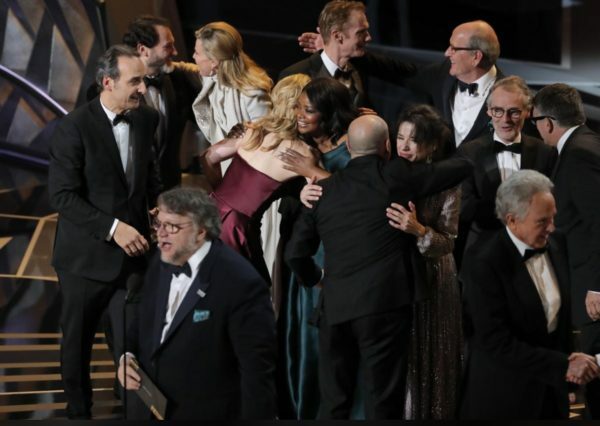 Fantastical romance“The Shape of Water” won best picture, U.S. Hollywood film industry’s most prestigious honor, at Sunday’s Oscar ceremony. The Fox Searchlight movie’s Mexican filmmaker, Guillermo del Toro, took home the best director Oscar, dashing the hopes of a rare win by a woman or a black filmmaker. The movie about a mute cleaning woman who falls in love with a strange river creature had gone into the ceremony with a leading 13 nominations, and won a total of four Academy Awards. Elsewhere, awards were spread around, recognizing first-timers, LGBT movies and films inspired by other cultures. Oscars host Jimmy Kimmel tackled Hollywood’s sexual misconduct scandal with jokes on a night heavy with nods to activism on issues ranging from LGBT issues and school shootings to sexism and racism. Gay romance“Call Me by Your Name” won best adapted screenplay and racial satire“Get Out” won best original screenplay. “A Fantastic Woman,” Chile’s groundbreaking story about a transgender woman, played by transgender actress Daniela Vega, won best foreign language film, and Mexican-inspired“Coco” was named best animated feature. Sam Rockwell, and Allison Janney took home their first Oscars for their supporting roles“Three Billboards” and independent ice-skating movie“I, Tonya,” respectively.